Tung Sin Tong is one of the most time-honored charitable societies in Chinese communities in Macao. With the supports from philanthropists and the society, Tung Sin Tong kept expanding all kinds of charity works, it has great contribution to the society. 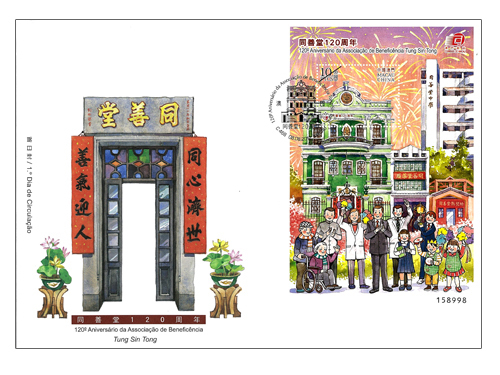 To celebrate its 120th anniversary, Macao Post will issue the stamp theme “120th Anniversary of Tung Sin Tong Charitable Society” on 8th August, 2012. 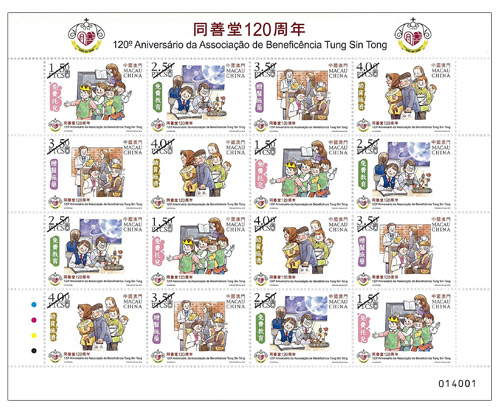 This is the same theme after the stamp “Centenary of Tung Sin Tong Charitable Society” issued in 1992. This issue includes a set of four stamps and one souvenir sheet, the stamps illustrate its four mainly free services include: Nursery Services, Education, Clinic and Medications, Help the Needy. 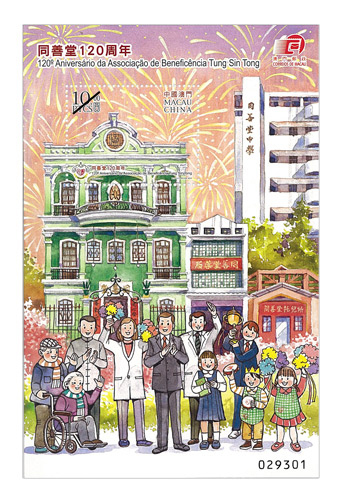 The objective of “Common wish to benefit society, virtuous atmosphere to welcome all” is the theme of the souvenir sheet. The stamp designer of this issue is Mr. Lai Ieng, and the text of the information brochure is written by Tung Sin Tong Charitable Society. This is the seventh issue in 2012. 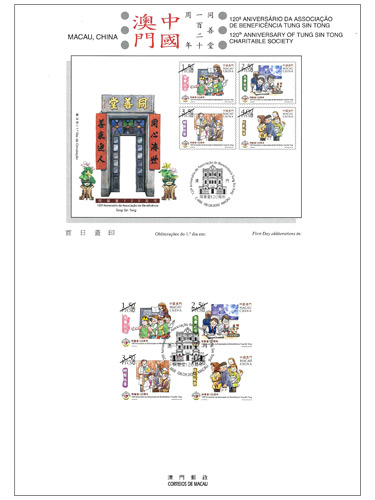 The previous issued stamps are “Lunar Year of the Dragon” on 05/01/2012, “A New Era of Smoke-free Macao” on 31/01/2012, “I Ching, Pa Kua VIII” on 01/03/2012, “70th Anniversary of Tai Fung Bank” on 28/03/2012, “Fishing Harbour in the Past” on 18/05/2012 and “80th Anniversary of the Founding of Hou Kong Middle School” on 10/06/2012. The idioms and their histories are precious cultural heritages of China. For thousands of years, the people have always been taking delight in talking about such stories and the idioms deriving from these stories make language performance more stylish as well as arouse more sagacious thoughts. 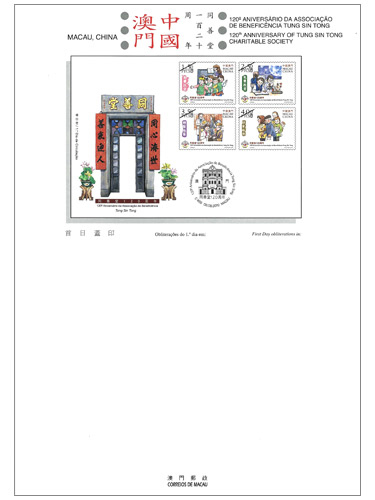 The postal administrations of Mainland China, Hong Kong and Macao have also released the related thematic stamps. 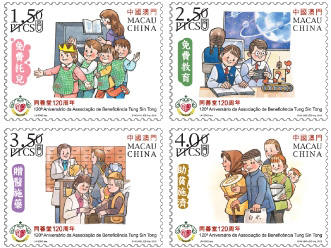 Macao Post, Guangdong Philatelic Corporation and Hongkong Post jointly compiled the idiom stamps as a philatelic collection, which became name cards spreading Chinese culture. The Joint Philatelic Collection of “Collect Stamps, Learning with Idioms” is presented in a hard cover, it comprises four series of idiom stamps previously issued by the three postal administrations, includes the first issue of “Seng Yu – Idioms” issued by Macao Post, the thematic of idioms include “Sleeping on a Woodpile and Tasting Gall”, “Watching Over a Stump Waiting for a Rabbit”, “The Fox Making Use of the Tiger’s Fierceness” and “Meng Mu Moving House Three Times”; the issues of “Sima Guang Breaking the Vat” and “Kong Rong Declines Big Pears” issued by China Post; the issue of “Chinese Idioms and Their Stories” issued by Hongkong Post, the thematic of idioms include “Mutual Help in Hard Times”, “Water Drops Wear Away Rocks”, “Practice Makes Perfect”, “Save to Give” and “As Deft as a Master Butcher”. 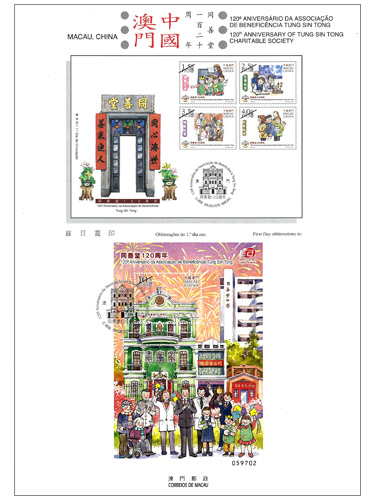 This philatelic collection will be available for sale at the Philatelic Shop of Macao Post Headquarters, “Rua do Campo” Post Office, Maritime Ferry Terminal Post Office, Airport Post Office, and the Communications Museum starting from 8th August, 2012. This collection is priced at MOP80.00, and it is an excellent product, to the stamp collectors and art lovers. 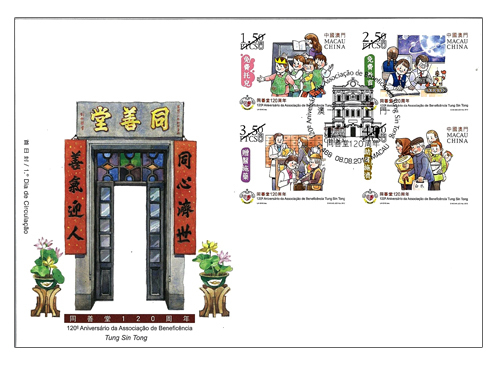 To celebrate the visit of the Delegation of Tiangong-1/Shenzhou-9 Manned Space Docking and Rendezvous Mission, Macao Post announces that a Temporary Post Counter will be set up at our Philatelic Shop located at Macao Post Headquarters at 9:00 to 17:30 on 13th - 15th August 2012 providing the commemorative postmark cancellation service for the “Delegation of Tiangong-1/Shenzhou-9 Manned Space Docking and Rendezvous Mission visits Macao”. To mark the commitment of the Macao SAR Government in anti-corruption, Macao Post will launch the stamp issue "20 Years of Safeguarding Honesty and Transparency" on 20 September this year. The issue allows the public to have better understanding on the task of the Commission Against Corruption. This will be the second issue with the same theme after the release of "10 Years of Safeguarding Honesty and Transparency" on 13 September 2002. Macao Post will launch the stamp issue "Lusophone Writers" on 9 October this year. This is a joint issue between the postal authorities from nine Portuguese-speaking countries/regions. This issue is based on the theme of Luso-Brazilian Philatelic Exhibition (Lubrapex) this year, selecting a representative figure of Lusophone culture of each region to illustrate the stamps.